Another weekend, another country, same story. F1 has decamped all of the 500+ mile distance from Silverstone to Hockenheim over the past two weeks, yet you'd hardly know it. The weather for one changed little, with qualifying proceedings disrupted by rain showers. And the outcome is exactly the same: Fernando Alonso topped the times imperiously and will start on pole position tomorrow. It probably hasn't escaped your attention that Alonso, to coin the British phrase, isn't necessarily everyone's cup of tea. And today on his radio at the end of the second qualifying session he (in effect) communicated to Charlie Whiting that he felt the conditions were too wet for matters to proceed. Just like Jackie Stewart before, Alonso's usually being among the first to raise the safety issue doesn't always win him fans in the strange world of F1. But also just as with Stewart his bravery absolutely cannot be called into question and is as committed as anyone when called upon to drive in such streaming wet conditions. 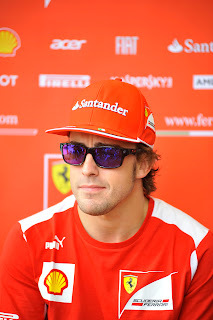 There was no delay to the itinerary and in such treacherous conditions today in the final session Alonso was consistently the fastest of anyone and took the pole by a clear four tenths of a second. As David Coulthard noted: 'I think the other drivers would also give Fernando Alonso a round of applause. That is a sizeable gap in very difficult conditions'. Harnessed to Alonso's skill was a Ferrari pit wall which got its approach spot on today. I, and others, haven't always been complimentary of Ferrari on the strategy front in recent times but today it was as sharp as a tack. It centred on two pivotal calls: one that Alonso changed wet tyres partway through the final session, giving him vital extra grip for his crucial last efforts, and the other that from an early stage it was clear that timing would be all, in that who was last over the line before the clock hit zero would have the driest track to set their time on and thus have a vital advantage. And so it proved: Alonso crossed the line last with but seven seconds to spare, and he then set the fastest time by a distance (though it transpired that his previous effort was good enough for pole anyway). Once again at the front it's boiled down to Alonso vs. Red Bull, as Sebastian Vettel and then Mark Webber were next up on the times (though Webber faces a five-place grid drop for a gearbox change, so will start eighth). So at the sharp end tomorrow, at least initially, it'll be a Nando vs. Seb face-off and the pair sometimes give the impression of there being a little needle between them. Things for the race perhaps aren't quite as simple as that though, as some other contenders seem to have the legs of the front three. The McLarens, post upgrades, have looked right back on it (not that I thought they were ever all that far away from it in the first place) both in the dry and in damp conditions. However, not for the first time the team had an operational fail in the final qualifying session, doing the opposite to Ferrari, i.e. not changing tyres and not even nearly being last over the line at the end. 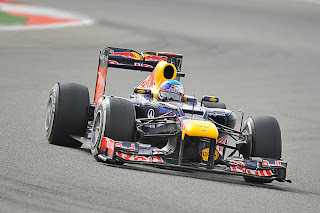 Partly as a consequence of this seventh and eighth best times were the best they could do, though both are promoted one by Webber's penalty (and Jenson qualified ahead of Lewis for the first time this year), and in any case the car didn't seem quite the best when it got really wet in the final session. And then there's Kimi Raikkonen starting 10th tomorrow, who stunned everyone in the first qualifying session by setting an amazing 1m 15.693 secs lap and doing so on the harder tyres, much quicker than anyone else even when on the softs. With rain predicted to stay away tomorrow the McLarens and Kimi could well ghost in on the front runners. 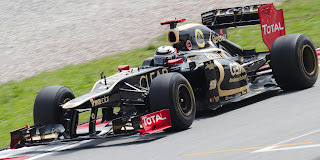 This may be especially likely with Raikkonen; the Lotus and its gentle tyre handling is always one to watch in a race and tyre wear is usually high at Hockenheim. And overtaking is always possible around this track. 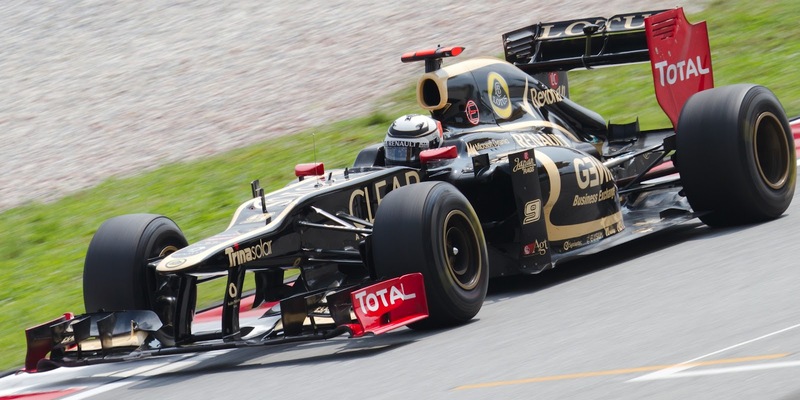 Kimi Raikkonen, one for us all to watch in the race? Not that everyone between them and the front will be easy to clear though. There lies both Michael Schumacher and Pastor Maldonado, both of whom have cars that sometimes need to be treated like the hind legs of a mule. So, a tense Alonso vs. Vettel scrap at the front, plenty of guys in the field who could sneak up on them but also facing things that could go wrong, and tyre wear likely to be a key differentiator. Lots to happen tomorrow.